For the Russian version use Russian patch 1.0.0.1. Place it in <path-to-game>\data\frontend and replace the original file. Download Gibbed.DeadRising2.Tools and extract it somewhere. Go to the Dead Rising 2 installation folder, and open the data folder. 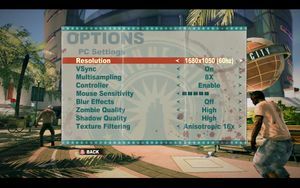 Drag datafile.big and place it onto Gibbed.DeadRising2.Unpack.exe. When it's finished unpacking, open the datafile_big folder that was created in the data folder. Open camera.txt with Notepad, and click Edit -> Replace. Type FOV = "43" in the Find, and FOV = "63" in the Replace (change 63 to desired FOV) and click Replace All. Some other cameras use FOV = "45" which can also be replaced, such as in the cVehicleBehaviorCam PushableCam section. Drag the datafile_big folder and place it onto Gibbed.DeadRising2.Pack.exe. This will create a new file called datafile_big.big. Backup the original datafile.big by renaming it to something else. 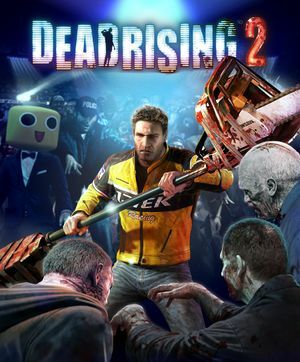 Set the Path to <path-to-game>\deadrising2.exe. Negative mouse acceleration is active. Only if controller is disabled. 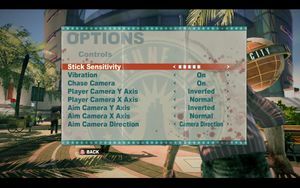 Only Microsoft brand Xbox 360 controllers work, third party controllers are unrecognized by the game and the option to enable a controller will be grayed out. Co-op: Co-op campaign (2 players). Versus: Terror Is Reality mode. This issue was resolved in the 20 May 2015 patch released for the Steam version. The game may show the following error after start: Games for Windows - LIVE has encountered a corrupted file. Please reinstall the game fix. This error is related to "Game for Windows – Live! Zero Day Piracy Protection". This issue happened when trying to launch game from Steam under Windows 8.1 64-bit. It is unknown if it happens under different OS versions or retail version. Run zdp.exe. The game should launch successfully. From that point, the game should work fine when launching through Steam normally. The game is not launching after successful release date check on Windows 8 and later. Change COMMAND_PLAYER_MAIN_ITEMS_CYCLE_LEFT from BUTTON_L1 to BUTTON_R1. Change COMMAND_PLAYER_MAIN_ITEMS_CYCLE_RIGHT from BUTTON_R1 to BUTTON_L1. ↑ 2.0 2.1 File/folder structure within this directory reflects the path(s) listed for Windows and/or Steam game data (use Wine regedit to access Windows registry paths). Games with Steam Cloud support may store data in ~/.steam/steam/userdata/<user-id>/45740/ in addition to or instead of this directory. The app ID (45740) may differ in some cases. Treat backslashes as forward slashes. See the glossary page for details.